Cauliflower rice is a lifesaver if you're doing Whole30 or a low-carb diet. With its mild taste and the same fluffy texture as rice, you'll never miss traditional grains! This flavorful recipe combines marinated chicken and riced cauliflower for an easy one-pot meal—perfect for a healthy, weeknight dinner. 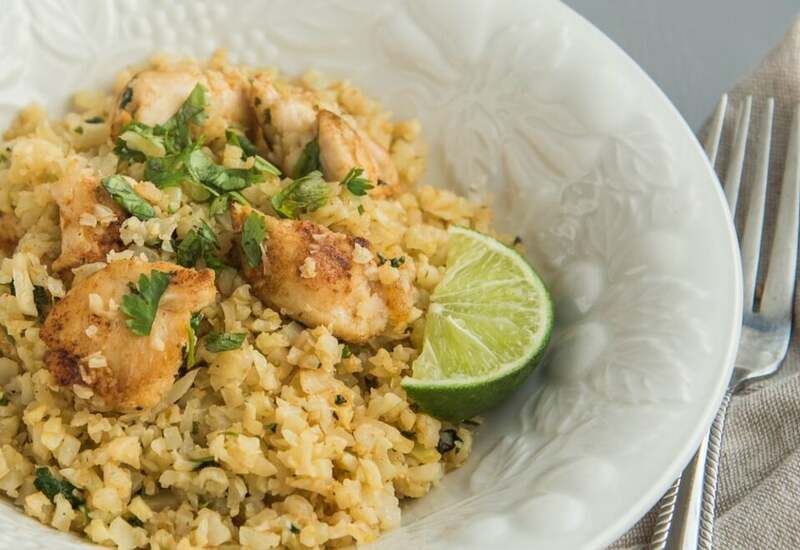 The bright flavors of cilantro and lime add zest to the mellow chicken and rice, and it takes only 10 minutes of prep time. If you feel like the rice is getting too dry, add another quarter cup of chicken broth to the pot. Serve with extra limes and your favorite hot sauce! You can also easily make cauliflower rice in your kitchen instead of purchasing it. Add 3 cups cauliflower florets to the bowl of a food processor, then pulse until finely chopped. Scrape into a bowl and cook as directed in recipe. The rice will keep in the refrigerator for up to 2 days. Per Serving: 229 calories; 8g fat; 2.5g carbohydrates; 36g protein; 96mg cholesterol; 167mg sodium. I couldn't find cauliflower rice (go figure, I swear I just saw it somewhere), so I just pulsed a pound of cauliflower florets in my food processor until they looked like rice. Voila! Tasted sooooo good with chicken and cilantro. Loved using lime for this -- would have thought lemon, so this was a vibrant change of pace. I love cauliflower rice, and this version with the lime chicken was so delicious! The cumin, lime, and cilantro together were incredible. It's super light and delicious. This makes eating "healthy" so easy! I made my own caufliwer rice in my pressure cooker, best decision ever! This was a really delicious dish. Definitely will make it again. I used regular rice with the cilantro lime chicken and it was really good. I also used chicken thighs instead of breasts, but to each his own. Cumin, salt, and pepper were perfect for seasoning. Glad I tried this out.